Our baby girl is out of the womb and has made her presence known in the world! 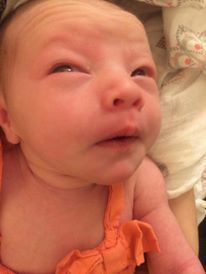 Kora Rose (whom we mostly call “Kora” or sometimes “Rosie,” due to her rosy cheeks and lips…or “Popcorn” due to her startling reflexes…or “Almond” due to her almond eyes….you get the picture…) was born on July 15, 2015 at 3:19 p.m. She was 21 inches long and 7 pounds 12 oz. When the doctor put her on top of me she was covered in all kinds of disgusting muck and I laughed and cried and thought she was the most beautiful thing I’d ever seen. Her daddy, who never cries, was also choked up as he cut the umbilical cord. Right now she is a very brand-new human, so we are just at the beginning of learning about her. She loves music and loves to “dance,” being held and swayed as one of us waltzes her around the room. It calms her down and she seems to have a fascination with the rhythms. I wonder if she’ll be a dancer or a musician. She seems to like oldies, like her parents do, and calms right down to the tunes of Louis Armstrong and Frank Sinatra. As far as I’m concerned, I had a pretty darn easy labor and delivery followed by not-so-easy-injuries-from-stuff-that-happens-during-delivery. It was really good to have Mama G (Dane’s mom) here to help us out for the first week and a half we were at home. She’s seriously amazing. Then my BNFFL (best nerd friend for life and Kora’s “fairy godmother”) came to visit us for a couple of days. So with all that I’m only on Day 2 of alone-with-baby-during-the-day. I’m feeling pretty good physically at this point and am happy to be blogging right now with this precious girl in my lap. Pretty soon I’ll have to figure out how to balance this with real life, but right now I’m just learning about being a Human Feeder, wearing real-people clothes again and keeping my house relatively (relatively speaking)….tidy. Tidy-ish. Basically, we are in love with this tiny girl. Wonderful and as it should be! This is so similar to us…down to the fact that Knox usually has his mom’s eyes and his dad’s mouth. Also, Lydia’s mom and sis left about 3 weeks in, so she is figuring out the same things. So glad to see you’re enjoying her so much! God is very good.